Advertising opportunities on Chikungunya Virus Net include standard size banners as well as text ads. Click here for more information about advertising. You can also make a donation by PayPal and support the Chikungunya Virus Net website. 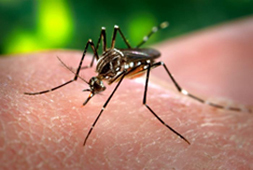 The yellow fever mosquito, Aedes aegypti is a mosquito that can spread the dengue fever, chikungunya and yellow fever viruses, and other diseases. The mosquito is a small, dark mosquito of approximately 4 to 7 millimeters with typical white markings on the legs and a marking of the form of a lyre on the thorax. Females are larger than males, and can be distinguished by small palps tipped with silver or white scales. Aedes aegypti is a day biting mosquito. That means that the mosquito is most active during daylight, for approximately two hours after sunrise and several hours before sunset. The mosquito rests indoors, in closets and other dark places. Outside, they rest where it is cool and shaded. The males of all species of mosquitoes do not bite humans or animals of any species, they live on fruit. The female of Aedes aegypti feed not only on fruit, but also on blood. When viewed under a microscope, male mouthparts are modified for nectar feeding, and female mouthparts are modified for blood feeding (see figure 2). The female needs blood to mature her eggs. Feeding on humans generally occurs at one to two hour intervals. The mosquito attacks generally from below or behind, usually from underneath desks or chairs and mainly at the feet and ankles. Aedes aegypti is adapted to breed around human dwellings and prefers to lay its eggs in clean water which contains no other living species. These eggs become adult in about one-and-a-half to two weeks (see also Life cycle of Aedes aegypti). In chikungunya virus infected mosquito's, the virus is present in the salivary glands of the mosquito. When a female Aedes aegypti bites a human for food, she injects saliva into the wound where the anti-coagulants contained in her saliva facilitate feeding. Without knowing, the mosquito also injects the chikungunya virus into the host. Since the virus can be passed from adult to egg, the virus is guaranteed to survive until the next summer and heavy rains. The mosquito originated from Africa, but is now present globally in tropical and sub-tropical regions (see also Epidemiology). The mosquito has a so-called cosmo-tropical distribution annually, and spreads to more temperate regions during the summer. Living near man Aedes aegypti has become largely dependent on and adapted to humans. For instance, the mosquito has greatly reduced the `humming' sound it makes with their wings. Humans nearly hear Aedes aegypti, unlike other species whose humming is extremely irritating and awakens the deepest sleeper. The insect is very fast in flight unless gorged with blood. Other types of mosquito even fly into your face and can be easily caught or killed, not Aedes aegypti. In South America, Aedes aegypti distribution extended from the southern United States down to Argentina in the 19th century. The mosquito was nearly eradicated due to the development of a successful eradication program as a method to control yellow fever through mosquito control and manipulation of breeding sites. Though initially successful, Aedes aegypti has re-established in most parts of South America due to lack of commitment and financial backing necessary to maintain the eradication program (see figure 3). The program is no longer operational today. In the United States, the mosquito is found in at least 23 states, including the southeastern U.S., up the east coast to New York, and west to Indiana and Kentucky. 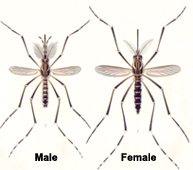 The mosquito Aedes aegypti comes in three polytypic forms: domestic, sylvan, and peridomestic. - The domestic form breeds in urban habitat, often around or inside houses. - The sylvan form is a more rural form, and breeds in tree holes, generally in forests. - The peridomestic form thrives in environmentally modified areas such as coconut groves and farms.